So, I started out today’s card thinking I wanted to make a Five Minute Friday card. Then I got stuck and couldn’t figure out how to finish it. Two hours later… I’m way past the whole “five minute” thing. By a lot. Does that happen to you? You start a card knowing exactly where you’re headed. And as you start to glue things down, you realize it’s not turning out exactly as you thought it would. Or something looks out of place, but you can’t figure out what. 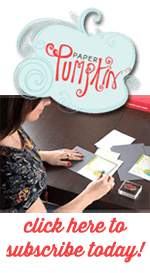 Or you realize you did that exact same thing on the last two cards you made. Then you realize you’re stuck. And you’re afraid to go any further because you don’t want to mess up what you have so far. How do I get unstuck? I set it down, walk away, and go do something else. Seriously. Ignoring the problem makes it go away. I know that’s usually not the case (hello, April 15th, I see you coming). But when it comes to a creative block, this is exactly what you need: to forget about the problem. I find that when I come back to the card or project, I’m now looking at it with fresh eyes. And I’m ready to go! 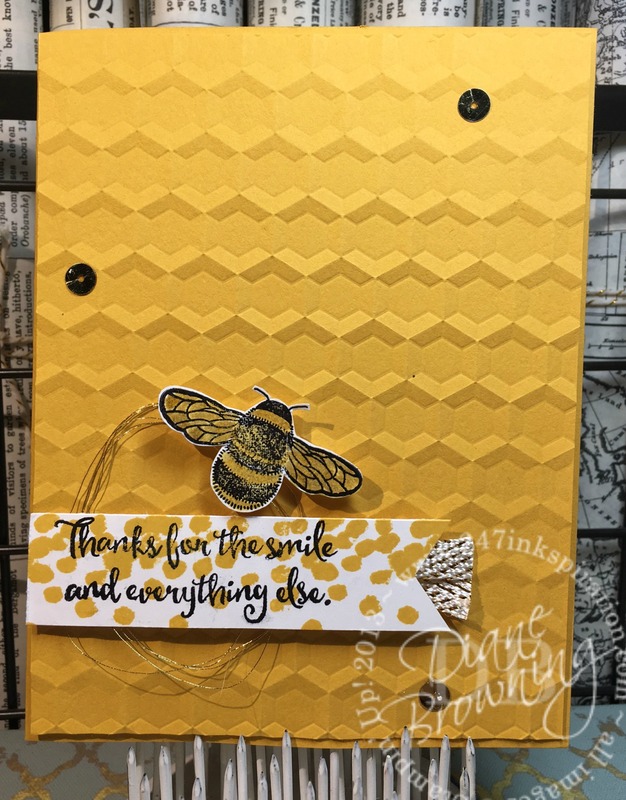 I saw a couple ideas online where people had combined the new Hexagon embossing folder with the bee from the Dragonfly Dreams stamp set. 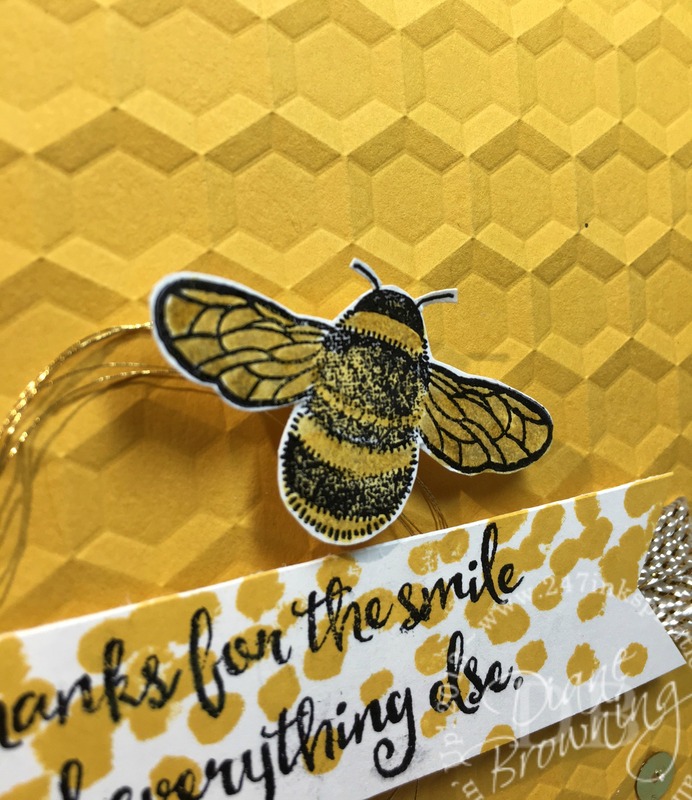 The Hexagon embossing folder really does resemble a bee hive. I knew I wanted to use rich yellows and golds on this card. But trying to decide how many embellishments to use was where I got stuck the first time. I left the items laid out on the card and then walked away. When I came back, I could see right away what the problem was: the doilie. The doilie, which of course you can’t see because it isn’t on the card anymore, was just one thing too many. And the white color of the doilie threw off the whole look. I could have colored the doilie, but it still would have been too much with everything else I was using. The bee is stamped in Crushed Curry and Basic Black. Then I colored over the Crushed Curry in the Gold Wink of Stella. If you look closely below, you can see the bit of gold sparkle in the bee’s wings. I added the scattered sequins to give the card a bit of sparkle. The Gold Metallic Thread gives the bee a place to perch. This turned out to be such a pretty monochromatic card. I hope you are having a fabulous Friday. Just remember to bee happy!